I believe the jury in the George Zimmerman case (its “not guilty” verdict having been rendered a few days ago) did have a choice. They didn’t have to adhere to the judge’s restriction to only regard the immediate confrontation between Zimmerman and Trayvon Martin as the basis for their deliberation. Had they wanted to, the jury could have a returned a manslaughter verdict, rejecting Zimmerman’s plea of self-defense as inadequate when it was Zimmerman himself who started the confrontation. How then to account for the “not guilty” verdict? I would suggest that group-think set in after many hours of jury deliberation. The jury seems to have concluded that Zimmerman was reasonable to suspect (and confront) a black teenager with a hoodie walking in an upscale neighborhood. Trayvon fit a racial profile, a very negatively charged one. And he paid the ultimate price. Although a manslaughter or 2nd degree murder conviction may have been overturned by the appellate court, such a verdict would have sent an important message. If you “start it,” if you stalk somebody, whether your gun is displayed or not, you don’t have a defense if the person being stalked “stands their ground” and resists you. Such a conclusion is grounded in the common sense we all developed in grade school, in the playground. Verifying these suppositions for Zimmerman would impede his agency. So he acted without thinking, as a vigilante cop. Presumably, Zimmerman believed if he didn’t act, which included in this case the possibility of using deadly force, the “suspect” would get away. If you carry with you strong racial stereotypes, together with a wannabe cop mentality, it’s relatively easy to justify vigilante-style action, since a person of color doesn’t count for much anyway in the eyes of a racist. That said, Zimmerman is neither a sadistic killer nor a psychopath. Nor is he a person who killed out of passion or some deep-seated emotional reason that only a psychoanalyst can ferret out. Rather, he is just an ordinary guy who saw, maybe still sees, his mission in life as going after punk-looking, usually black, teenagers because they are the ones allegedly threatening our neighborhoods and communities. The question to be asked by sociologists and psychologists is what kind of upbringing, what kind of primary and secondary school education, and what elements in the popular culture are conducive to the development of the Zimmerman mindset? The George Zimmermans of this world are certainly not the consequence of aberrant genes or hormones gone awry. They may not even enjoy what they do. They may actually have a sense of obligation to their communities and society in general. For George Zimmerman, racially profiling and stalking Trayvon was all in a day’s work, albeit unpaid work. But for Trayvon, the target of a mindset that sees black teenagers as at best dangerous suspects and at worse armed and dangerous hoodlums, it was literally his last day on earth. 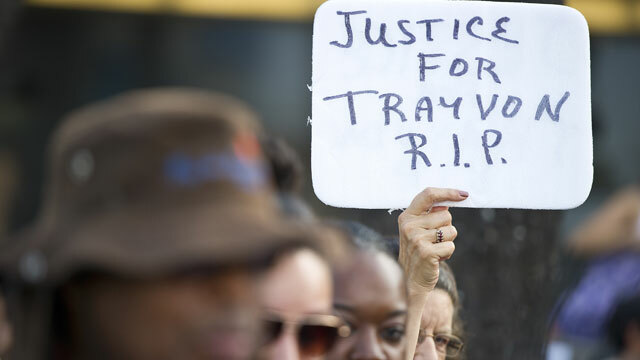 How do we save the Trayvons of the world from being treated as guilty until proven innocent? From being shot to death while trying to escape from harm? After all, didn’t Trayvon have a right to life? Didn’t he have a right to stand his ground after being confronted by a larger, and most definitely armed and dangerous, man? And shouldn’t someone be held accountable for his death? Richard Sahn is a professor of sociology and an at-large contributor to The Contrary Perspective. Richard.. From what I have read ( but cannot verify) Zimmerman has a history of aberrant behavior. He is not your ‘average’ kind of guy. I have read that he had an incident in a fracas with a police officer, had a history of relations with a family member, and an obsession with becoming a policeman. To my knowledge this 28 year old had no regular job but let his obsession lead him to appoint himself a watch man with a gun. That alone is certainly more than ‘community service’ driven. Unfortunately there are many like him in this country who, lacking more constructive inner resources, take it upon themselves to police the moral behavior of others. I would look at the anti abortion protestors, the Westboro church crowd ,etc. Obsessions with becoming a police officer–as I did once myself, though much younger– than Zimmerman, as well as other things you’ve read about the guy, does, in fact, make him your average Joe and that is what is so frightening.My only point his that he wasn’t psychotic nor psychopathic. I agree with you whole heartedly that the problem also lies with the latent racism–or at best erxtreme naivete, of the jury but also the latent racism of the judge and prosecution. Even with “stand your ground” didn’t Trayvon have the right to resist Zimmerman.,.to stand his ground? My guess is that it was easy to make Martin appear as the alleged victim since he was–a-hemm –not around. I, too, believe that Zimmerman may have believed he was doing the “right thing,” but I also believe that he, as a conveniently “White”-for-the-trial man, never expected to pay much of a price, if any, for killing a Black hoodlum in a hoodie. Trayvon Martin has been tried much more thoroughly, and harshly, after his death, than George Zimmerman ever was, or might be in his entire life. You have written a fine piece. And for or all its minuses and shortcomings, I still have faith in the Academy… Thank you. You ought to debate blogger Neo-neocon on the Zimmerman controversy. She offers, quite cogently and convincingly, the opposing take to yours in a series of posts on her blog, which argue that Zimmerman acted reasonably under the circumstances, even admirably as a neighbor, and has been slandered by a false narrative.